Each fingerprint has a ‘micro-life’ of its own. There is an announcement programmed within the design of each glyph depending on the finger where it resides. Just like nature, with her assortment of patterns, so too do the fingerprints reflect a precise illustration. That message plays out in the ‘macro-life’ of the owner. Let’s delve into the Composite Whorl. There are a variety of types of whorls that can be seen with the naked eye. If needed, a magnifying glass will help with your inspection. The whorl pattern must have two tri-radii to be considered a whorl. Red arrows, above point to each tri-radii. In the Composite Whorl the core is looping back around itself. The center looks like an “S”. If you or anyone you know has a Composite Whorl, with an “S” you may likely alternate between two specific aspects related to the print location. Location Matters – This fancy print can be found on any finger, thumb or impressed into the palm. The “S” Whorl reveals opposites – opposites of what? See the right and left hand finger descriptions on the hand maps below to better understand the opposites that are burrowed into each fingertip. The description on the top is the consciousness experienced while in the ‘on’ position. The description on the bottom is the interpreted awareness during the ‘off’ position. The two energies offer an opposing affect. There is vacillation between the two positions. Now, identify the location for your “S” Whorl. If you have one, or more, you’ll most likely be seeing movie scenes featuring both sides related to the associated finger it lives on. These movie clips can feature others’ lives as well as your own. These etchings have been imprinted on the owner since five (5) months prior to birth. The designs of all fingerprints are unalterable. This blinking effect of the “S” won’t go away or change. What you can change is your reaction toward the experiences you ‘see’. Junior Path: You feel stuck in the ‘off’ position. This is the down side, the bad hair day condition. You may even self-sabotage to remain fixed in the ‘off’ situation. Why might you stay stuck? Staying stuck is familiar. Being accustomed to a pattern can keep you locked in to that pattern, regardless if it boosts or busts your sense of well-being. But if you’re reading this, you’re more aware and willing to take the next step. Advanced Path: You recognize and learn from the ‘off’ position to get to ‘on’. You see the ‘off’ as a means to build character and develop your souls growth. At the same time, you experiment with your life lesson, more and more. To identify your life lesson, locate the digit(s) where your lowest ranking fingerprints reside. Master Path: You flip between both sides integrating the two extremes without entertaining an ‘off-balance-reaction’. You remain evenhanded and perceive life beyond the opposites. There is even a possibility that you find yourself in the ‘on’ position much of the time. When you find yourself on the Master Path, you have most likely confronted and embraced your life lesson. At your best, you have even exalted your life lesson. For example, I have an “S” on my right thumb (Success and Failure). On a regular basis I experience what I believe as failure and success. It’s a sense (both feeling and thought) of failure and success. I have let the fear of failure prevent me from achieving the results my deepest Self is calling for me to do and be. After having my hands analyzed, and playing with the toggle affects, I’ve learned to say “Yes to “S.”” Now, my reactions to potential failure are silenced. When I smell the sense of failure, I literally look in the opposite direction. I visualize success through trial and error. I honor the call for success in the moment and transcend into a deeper aspect of Self. Will I always be in this enlightened state? Who knows? It’s a learning journey and I’m in for the ride! On the learning path, the S-owner might say “Oh- no, someone save me, I’m in the “off” side (again). That pickle is actually a gift. I’m here to inspire you to say “yes” to “S”! Take responsibility and embrace the internal squabble. Use the perception to see your way to awakening to a deeper and more profound facet of your Self. I’d love to hear back from you if you have an “S” Whorl. 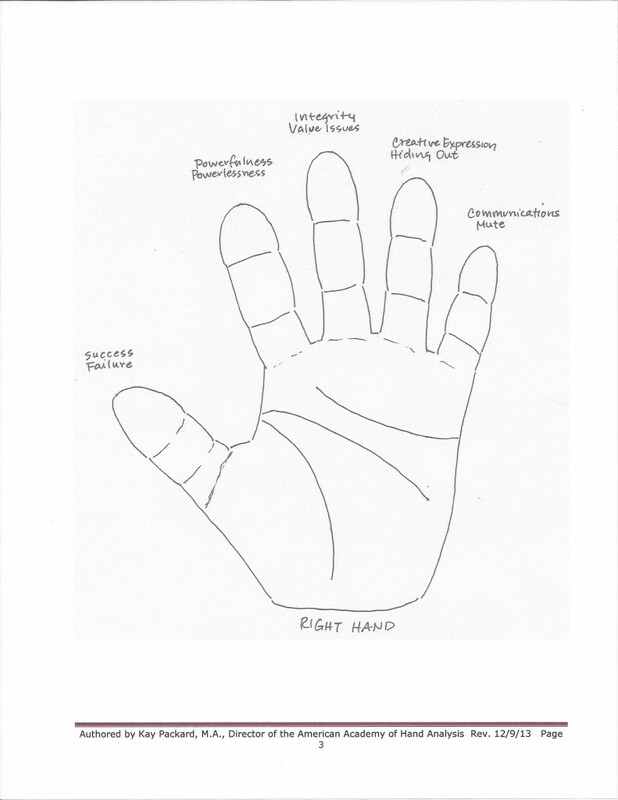 Tell me where you’re at on your path relative to the flip sides of the finger description where it’s located. If I’ve read your hands and you’d like me to check my files to confirm the possibility of the “S” you might be seeing on your fingertips, PLEASE ask me. I live for this work and the steps toward self-realization for everyone. If you’d like a first time or follow-on reading, let’s talk! Hand Analysis has helped thousands of people add incredible insights to their personal tool kits for manifesting their right life. The right life = the best life as determined by each individual. In the mean time, don’t let the “off” get in the way of your “on” and beyond! Bonus: Guide to Composites by AnnMarie Roth. AnnMarie researched composite whorls as part of her Year Long Certification project. As a bonus, she is sharing her brief guide how to handle composite whorls. Have you noticed how people’s thumb curve? Some are straight and some curve, while resting in their natural position. How do your thumbs pose? Notice these thumbs on a man I met at a gathering. 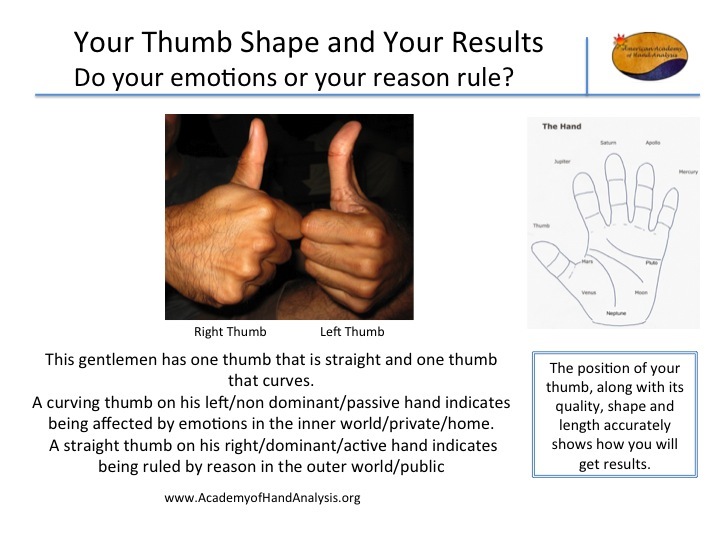 Click this Thumb Curve Diagram three page document for a simple Thumb Lesson – What does it mean when your thumbs are straight or curved? Are you ruled by reason or emotion? Consider both your left hand and right hand thumbs. Which ingredient, above, is most used in your success formula? 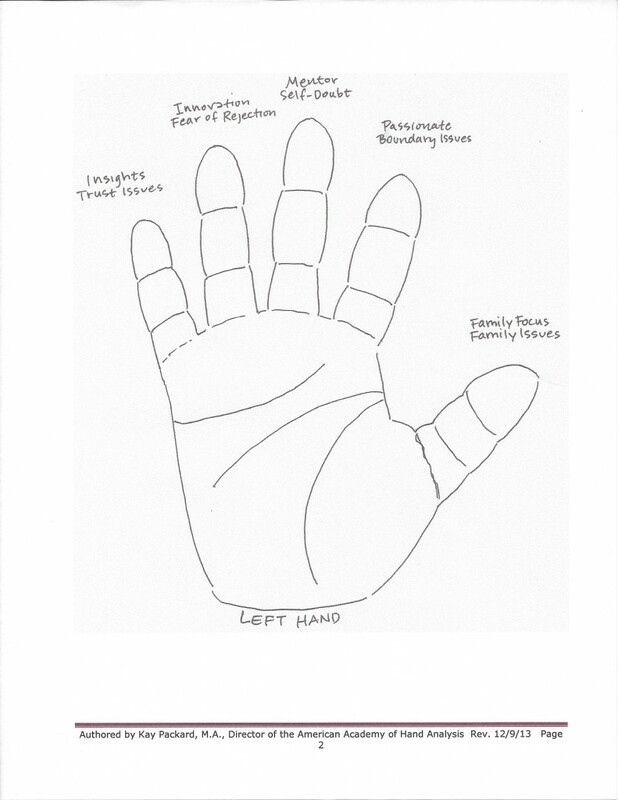 Check out the length of each section of your thumbs. Which is longest and which is shortest? Click on the diagram. Rarely are all three sections of the thumb equal in length. Its normal to have a primary ingredient, like flour in chocolate chip cookies.